If you are looking for fun and educational activities to keep kids busy and expand their horizons, then Native American crafts may be your answer. Whether you work with kids at a cultural center, a camp, or a school classroom, you can find a great project inspired by one of the many Native American cultures. Parents can also use these crafts to explore kids' heritage or just have fun together. 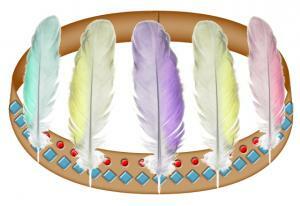 From dream catchers to rain sticks, crafts provide an excellent opportunity for hands-on learning and fun. 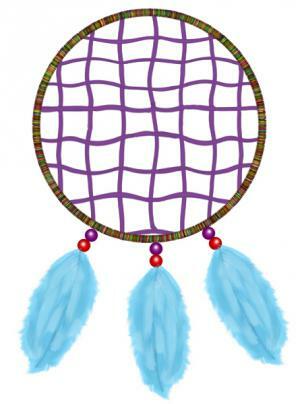 According to First People, a site that explains Native American legends, the dream catcher is designed to snare bad dreams in its web while allowing good dreams to pass right through. Although the traditional dream catcher is made out of wood, sinew, and other natural materials, kids can make a simple version from some basic household supplies. This craft is appropriate for children in elementary school. Cut the center from the round margarine tub so you have a hoop or large circle. Place the netting over the plastic rim and pull it tight, tying it together in the back of the hoop. Thread the wool yarn onto the darning needle. Loop the yarn all the way around the hoop through the mesh and plastic rim, covering the plastic. Cut off the end on the back side of the mesh where you tied the knot. Tie a piece of yarn at the top to hang it later. Tie some yarn from the bottom and decorate your dream catcher with beads and feathers. According to NativeLanguages.org, the Hopi Indians made Kachina dolls to represent the lives of their spiritual or religious icons. Some of the icons they represent are the singer, the buffalo, the badger, the ogre, the hunter, the rainbow, the eagle, and the sun. The adults in the tribe used the Kachina dolls to teach the children about their culture and religion; as a result, Kachina dolls were not toys. The following Kachina doll craft is a representation of the original wooden Kachina made by the Hopis, but it is made of cardboard. This craft is appropriate for older children. The first part of the craft involves using a hot glue gun and is best done by an adult if the children are young. Hot glue one end of the toilet paper tube to the cardboard square. Hot glue the Styrofoam ball to the top of the tube. Have the children think of the theme they want their Kachina doll to represent. For example, they can make a hunter, the rainbow, a buffalo, an eagle, a badger, or an ogre. If they are making the spirit of the badger, the doll will look human with a badger fur coat or a badger on its clothing. If they are making the eagle, the doll will have feathers to decorate its clothing. Decorate the doll with construction paper or cloth for the clothing. Color the face with ink markers or paint. Glue yarn on the head for hair. Add final decorations to the doll with feathers, seashells, beads, sequins, or whatever you want. Native Village reports that rain sticks were used by many Native American cultures to invoke the rain spirits to bring rain and to give thanks for rain received. Traditional rain sticks are made from dead cactus tubes. This craft uses a much more readily available supply, the paper towel tube. Kids of all ages will enjoy this project. Cover one end of the paper towel tube with construction paper, and tape it down to close that end of the tube. Cut two strips of foil three inches wide and twenty inches long. Crunch and twist each piece of foil into long thin strands. Twist one into a loose spiral around the other. Slide the foil into the cardboard tube. Pour half a cup of beans, rice, or popcorn into the tube. Cap the top end of the cardboard tube with construction paper, and tape it closed. 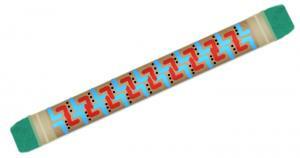 Decorate the rain stick with ink markers or crayons. According to Indians.org, the traditional feathered headdress could be many different colors and feature all kinds of designs. Among the Sioux, the culture thought to have originated the headdress, wearing it signified great power within the tribe. Kids as young as preschoolers can create a fun craft version of this important garment. Measure around the circumference of each child's head and cut the brown construction paper two inches wide to fit. Leave an inch or so for overlapping and stapling. Staple the paper together so it will comfortably fit the child's head. 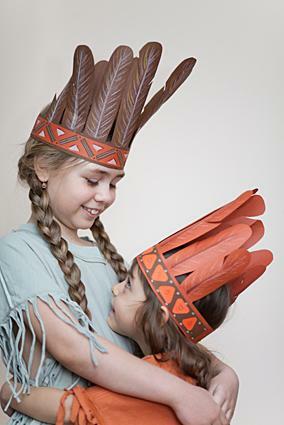 Carefully glue on colorful feathers to create a unique headdress the child can wear. Add more decoration with fabric and paint. Native American Art explains that medicine men did sand painting as part of the healing process. Kids of all ages can enjoy this unique art form as long as you have plenty of glue and a variety of colored sand. Use poster board as the base. Use the pencil to draw a simple design on the base. Dip a paintbrush in the glue and paint one component of the design at a time. 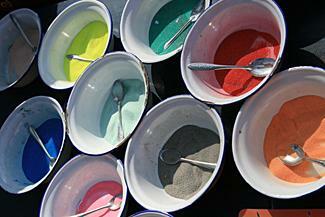 Sprinkle on one of the colors of sand onto the glue and allow the excess to slide off. Repeat with each color until the design is finished. According to Purdue University, Native Americans have been making clay pots for at least 27,000 years. You can use self-drying clay to create a Native American style pot of your own. Take a handful of the clay and shape it into a firm, round ball. You will need to dip your fingers in water to keep the clay damp. Using your thumb make an indentation in the center of the ball. Continue to turn it and press with your thumb until the clay on the bottom is about half an inch thick. Turn the clay and pinch the sides with the thumb and fingers to shape the pot from the bottom up. The walls should be about half an inch thick. Etch designs in the pot and set aside to dry. The history and traditions of the various Native American cultures are rich and inspiring. Craft projects can help children understand these cultures more thoroughly, and they'll have fun making something beautiful as they learn.